Sgt. 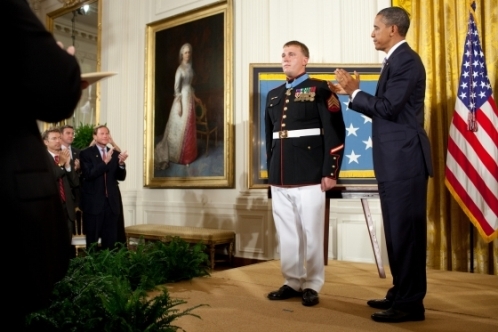 Dakota Meyer was presented the Medal of Honor in September, and it was hard to not get swept away in the excitement. Hundreds of people packed the East Room in the White House as President Obama hung the award around his neck. Millions more watched the ceremony on TV. And at the center of it all was a painful situation that will be difficult for families connected to the ambush in which Meyer’s heroism was honored to ever accept. I’ve written at great length about the Sept. 8, 2009, ambush in Ganjgal, Afghanistan, so there’s no reason to cover the same ground again (the most recent piece posted here). Still, it’s interesting to see various media outlets keep the story alive with fresh coverage, more than two years after the fact. Several stories appeared over the weekend about Meyer, Ganjgal and where everything stands. The Buffalo News, for example, focused on the attack from the perspective of Gunnery Sgt. Aaron Kenefick, a mentor of Meyer’s who died in the battle. Kenefick attended high school in Williamsville, N.Y., and will always be considered a local hero there. The San Antonio Express-News, meanwhile, has a well done piece highlighting what Meyer has been up to recently — including information about his recently filed lawsuit against BAE Systems, his former employer. A number of people have asked me my opinion on the suit, aware of the amount of time I spent covering Meyer and the aftermath of the ambush. I’ll say this much: If BAE Systems wasn’t aware that Meyer would express his opinion loudly and clearly while working for them, they probably weren’t paying attention before they hired him. Meyer doesn’t suffer fools, and I’ve never known him to shy away from saying what he really thinks. Anyone else I’ve met who knows him in any capacity is quick to say that, too. Meyer seems well aware of the standing the Medal of Honor gives him, and he’s using it in a variety of ways. Notably, the Express-News reports that Meyer has now raised $350,000 toward his $1 million Dakota Meyer Scholarship Challenge to America. The money will benefit the children of wounded warriors through the Marine Corps Scholarship Foundation.